TRENTON, N.J. -- A night after competing in Home Run Derby, Luigi Rodriguez and Will Craig produced the long balls that really counted. 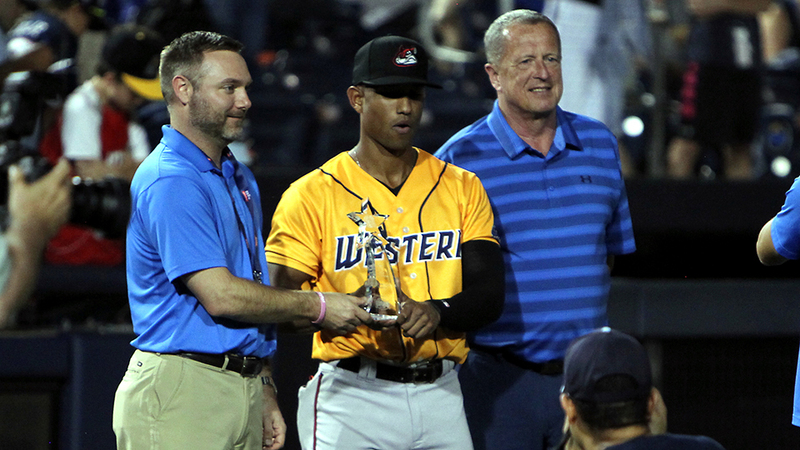 Rodriguez smacked a go-ahead solo shot in the eighth inning to secure BUSH'S® All-Star MVP honors. And when the Eastern League All-Star Classic ended in a 4-4 tie, Craig captured a head-to-head hitting competition that gave the Western Division the victory. "He's just a special hitter with the hand-eye coordination that he has. [Rodriguez] hit that ball off Caleb Frare like he did. Left-handed hitters just don't hit him," Western manager Michael Ryan of the Altoona Curve said. "It's fun to be on this side of it this time for once. Hopefully, he can limit that a little bit when he plays against us. It's a special type of player." Phillies prospects Deivi Grullon and Jan Hernandez provided the early offense with homers for the Eastern Division. The Western Division's first 13 batters were retired before Harrisburg's Taylor Gushue, Akron's Joe Sever and Connor Marabell and Altoona's Ke'Bryan Hayes strung together one-out hits in the fifth. As the momentum started to switch for the first time, the Eastern Division brought in Binghamton left-hander Daniel Zamora. Marabell and Hayes tagged up on a fly ball to right by Erie's Will Maddox, with Marabell scoring on a wild pitch to lift the West into a 3-3 tie. "I was very excited," Rodriguez said. "Before that, I was nervous because we had not done that well, but once that happened, the energy came up, like we were going to win the game." The score was still knotted, Rodriguez stepped up in the eighth, looking for a good pitch. The Giants outfielder connected on an 0-1 offering from Frare, who came into the All-Star break with an 0.69 ERA in 26 appearances. Rodriguez watched the ball sail over the yellow line in left-center field that separates a good at-bat from a great one. "It was a good feeling," he said. "I was proud of myself." Rodriguez spent the first eight years of his career in the Indians system before becoming a free agent in November. The Giants signed the 25-year-old in late February, just in time for Spring Training. Since switching Eastern League clubhouses, Rodriguez has 10 homers, three away from a career high while hitting .305 in 70 games with Richmond. "I feel like it's me knowing the league and also staying consistent with my routines and my mechanics, definitely helped translate from last year," he said. The East rallied in the ninth as Binghamton's Patrick Mazeika singled and scored the tying run on a double by Trenton's Trey Amburgey. Before the game, Ryan was informed that a hitting competition would take the place of extra innings. His first choice, top Orioles prospect Ryan Mountcastle, declined. So with the score knotted at 4-4, the skipper turned to Craig. "Somewhat volunteered, somewhat was chosen after [Tuesday], which I get, I did pretty well. But was definitely dragging a little bit after all the swings [in the Derby]," the Pirates' 16th-ranked prospect said. "They said, 'Don't hit ground balls.' I said OK, so I tried not to do that." Knowing home runs were worth the most points, Craig was looking to leave the yard. He did, totaling 305 points. Reading's Zach Green stepped to the plate for the Eastern Division and came up 30 points short. "It's definitely something you think about when you're in your backyard, playing with your dad or the local kids in the neighborhood, whoever, having a swing-off," Craig said after taking a Gatorade bath. "That was really cool."